On March 25th a demonstration “in support of Jerusalem” held in Rabat, Morocco, attracted a reported 100,000 participants. Protesters also stormed the parliament building in which a meeting of EUROMED was taking place and the Israeli delegate had to be taken out via a side door and rushed to the airport under heavy security. Morocco’s majority Islamist ‘Justice and Development Party’ boycotted the meeting and was also apparently the organiser of the demonstration. The protesters chanted “The people want to free Al Aqsa” and “A million martyrs are going to Jerusalem”. Israeli flags were burned. According to a Moroccan Arabic-speaking source asked by this writer to examine the video, there are also chants of “The Moroccan nation supports Palestine” and “In blood we will redeem Jerusalem”. Update: according to a report from Al Arabiya, the presence of an Israeli representative at the EUROMED meeting was condemned by Khaled Sofiani of the National Action Group to Support Iraq and Palestine. Sofiani (also spelt Soufiyani or Soufiani) is the Global March to Jerusalem coordinator in Morocco. 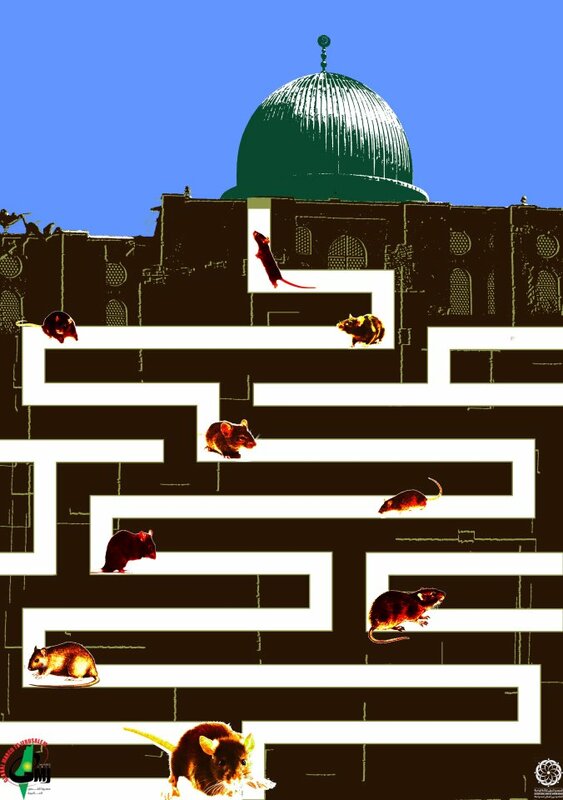 In a manner reminiscent of the way some animals and birds puff themselves up in order to appear larger to their adversaries, organisations associated with various organisers of the Global March to Jerusalem are issuing endorsements and statements which, at first glance, suggest a much wider support base than actually exists. 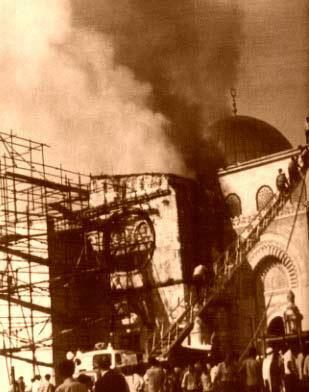 “The Federation of Islamic Organisations in Europe (FIOE) invites Muslims, and the management bodies of organisations, Islamic centres, and mosques across the European Continent to dedicate the last week in March 2012 to intensive activities in support of the city of Jerusalem (al-Quds) and the blessed al-Aqsa Mosque, given the escalating Israeli threats to the city, its holy sites, and the Palestinian inhabitants. 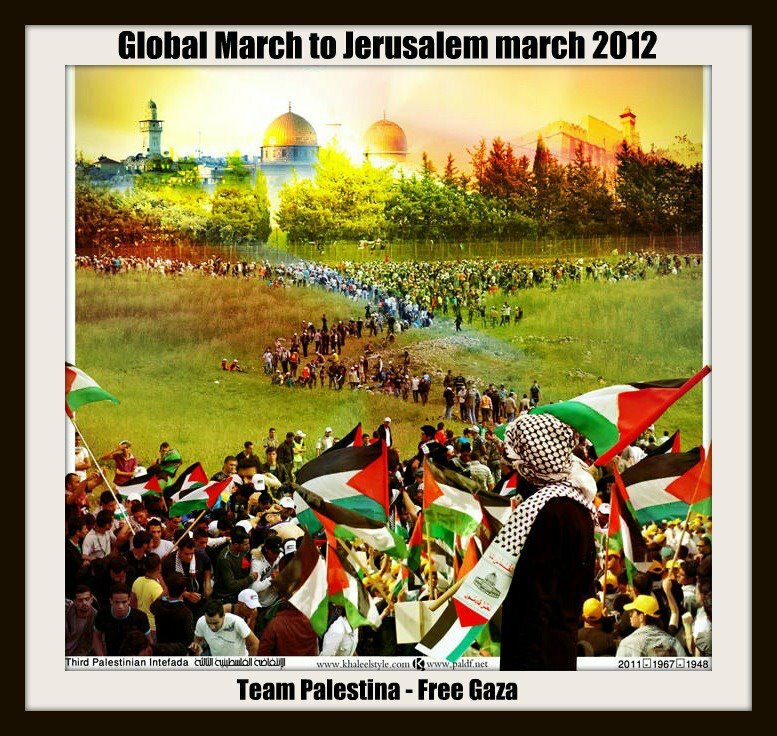 This initiative comes as part of worldwide efforts to support the just cause of Jerusalem, including the ’Global March to Jerusalem’ on 30 March 2012 in opposition to Israeli occupation and prevailing for the values of truth, justice, liberties of peoples, and human dignity. The FIOE is, however, hardly an objective bystander. It is the umbrella organization of Muslim Brotherhood groups in Europe, with much of its funding coming from Gulf sources. 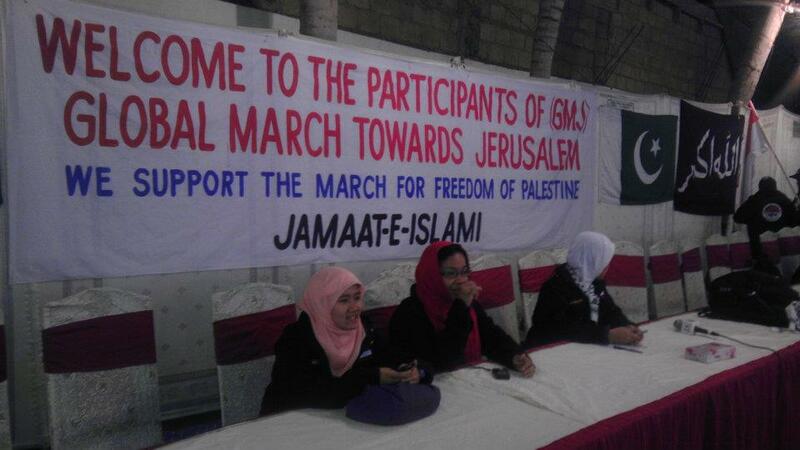 Several of the GMJ organisers are functionaries of one or more of those groups or branches of the Ikhwan elsewhere whilst still others among the GMJ organisers are members of or associated with Hamas – a Muslim Brotherhood offshoot. 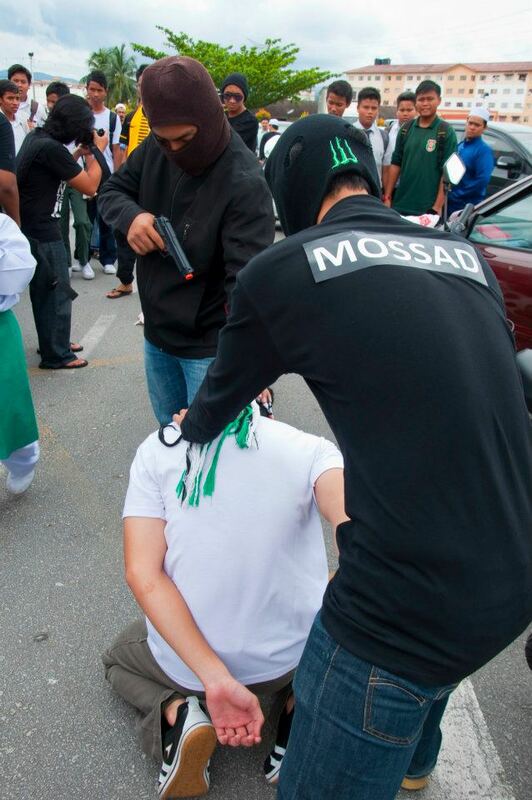 In addition, the FIOE has ties to groups and personalities engaged in fundraising for Hamas. Head of the Dublin-based ‘European Council for Fatwa and Research‘ – established by FIOE in 1997 – is Yusuf Qaradawi, who also heads the ‘Union of Good’ which is banned by Israel and the United States because of its provision of funds to Hamas – a proscribed terror organization. 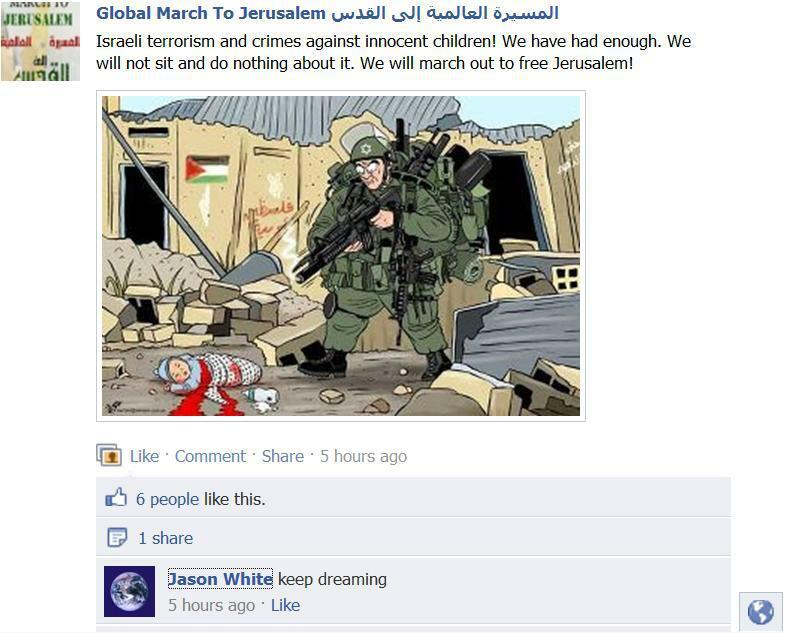 The ‘Union of Good’ includes the owners of the Mavi Marmara – the IHH – (representatives of which are among the GMJ organisers) and a British charity named ‘Education Aid for Palestinians’ of which GMJ spokesman Zaher Birawi is a trustee. Qaradawi is of course noted for his extreme anti-Semitism, admiration for Hitler and homophobia. He resides in Qatar, where he has a regular slot on the regime-owned TV station Al Jazeera, and has recently been banned from entering France. 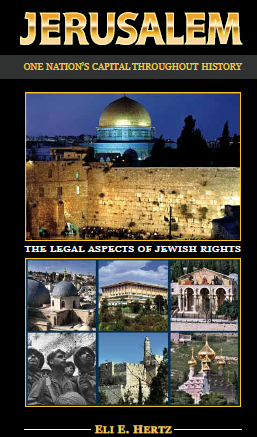 The FIOE’s expression of support for the Global March to Jerusalem is, therefore, akin to a glowing review of a book on Amazon written by the author’s mother. The Hizballah website ‘Moqawama’ features an interview with the GMJ media co-ordinator in Lebanon, Dr Abdul Malik Sukaryeh. Blood on the palms, eyes to the land, and hearts’ beats race the path. From all over the Globe they came with the same goal and one loud cry. Al-Quds was, is, and will remain Palestinian. Choosing an unprecedented path, they launched their move. From the close borders with Palestine they are to fulfill a dream and reiterate a vow. March 30th, 1976: “Israel” massacred dozens of Palestinians striking “Israeli” decision to confiscate Palestinian lands. It was “Land Day”. One cannot but wonder if Syrians engaged in the year-long struggle against Bashar Assad’s regime would agree with Sukaryeh’s priorities, but his statement does provide insight into the fact that any events on the Syrian border with Israel on March 30th will certainly be orchestrated and approved by the incumbent Hizballah and Iran-backed regime in Damascus. “On the crossroads of hard choices, participants in the Global March to al-Quds are ready to face with their screams, banners, and position all types of “Israeli” brutality. 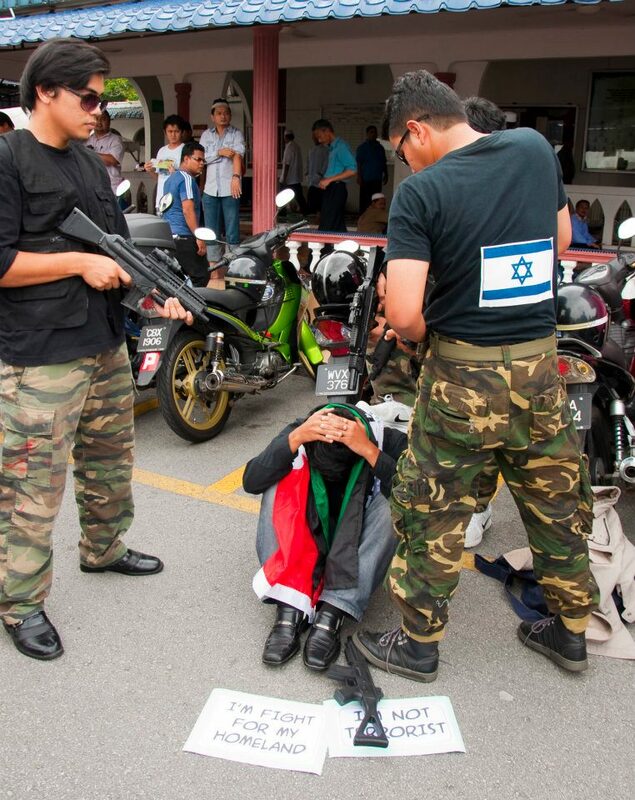 “Israel fears us,” Sukaryeh responded to “Israeli” threats of confronting the protesters with an iron fist. 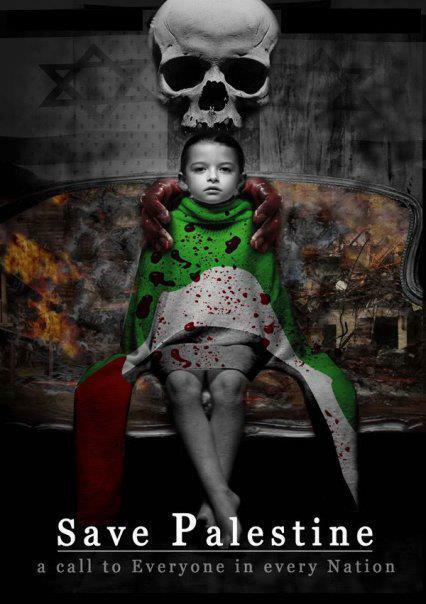 “The history of the Zionist entity is full of crimes and terrorism. We won’t be surprised if “Israel” attacks the peaceful protesters but we aren’t afraid and nothing will defeat our will even if the “Israeli” fulfilled its threats of air striking the rally. We are to continue,” the media organizer stressed. Clearly, some GMJ organisers are actually seeking a violent confrontation which would serve their publicity purposes and provide an opportunity for further assaults on Israel’s legitimacy in bodies such as the UNHRC. Sukaryeh also reflects the approach voiced by some of the other non-Western organisers of the march according to which, the project aims to be the first leg of a ‘third Intifada’. 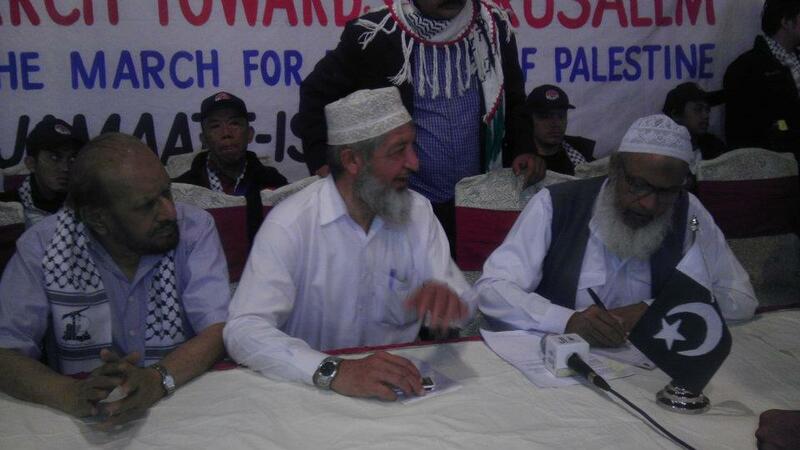 The South-East Asian delegation of the Global March to Jerusalem arrived earlier this week in Pakistan and, after a press conference at the Karachi Press Club, was given a warm reception at a dinner held on March 12th by members of the hardline Islamist party Jamaat-e-Islami, the Palestine Liberation Foundation Pakistan (PLF-P). On March 13th the delegates visited the mausoleum of Quaid-e-Azam Mohammad Ali Jinnah in the company of the Palestinian representative in Pakistan, members of the Palestine Liberation Foundation-Pakistan and Jamaat-e-Islami. 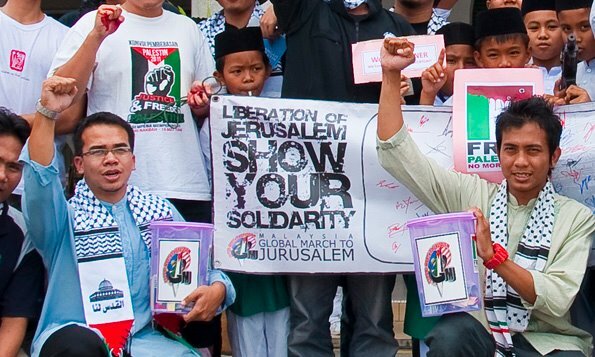 The South-East Asia delegation to the Global March to Jerusalem is comprised of 42 members from Malaysia, Indonesia, the Philippines and India. 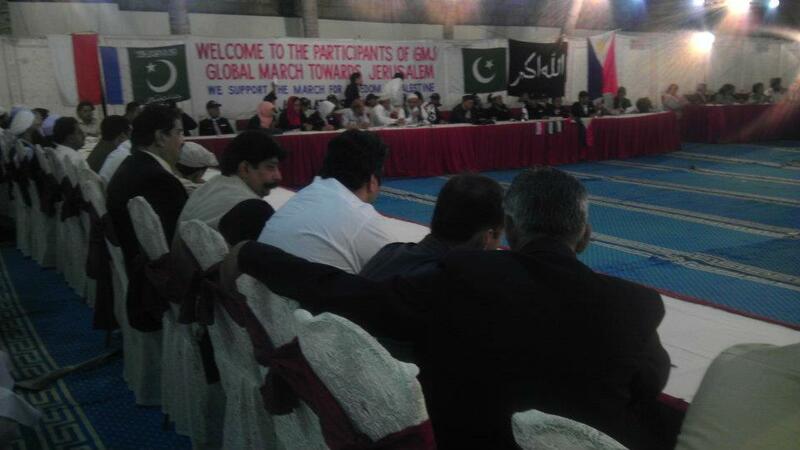 A further 27 delegates from Pakistan will be joining it before it continues on its way to Iran on March 15th. 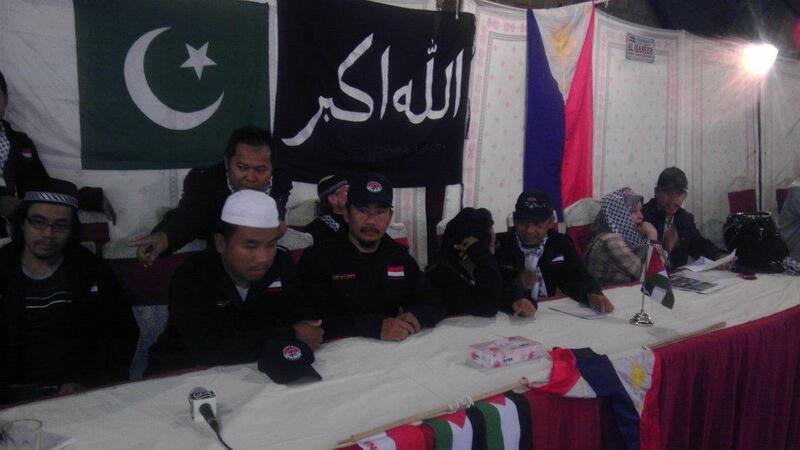 The Pakistani contingent is made up of members of Students of Palestine in Pakistan (General Union of Palestinian Students) and the Palestine Liberation Foundation – Pakistan. 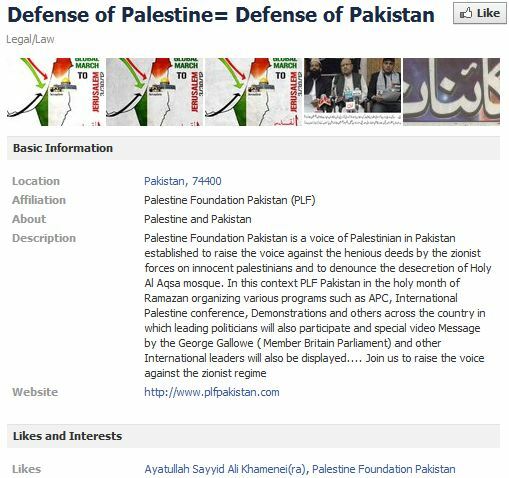 In 2010 the PLF –P organised an ‘International Palestine Conference‘ at which Osama Hamdan of the Hamas politburo gave a recorded address. GMJ International Executive Committee and International Central Committee member Feroze Mithiborwala took part in other conferences organized by the PLF –P in 2011. The same account also links to the Facebook account of the leader of the Iranian regime, Khamenei. How much longer are we gonna be silent??? 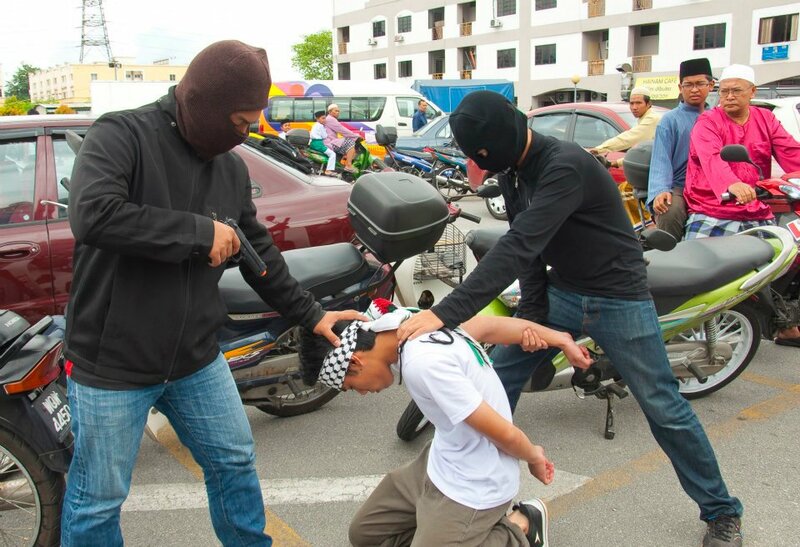 Are we going to wait until this crime happens again??? 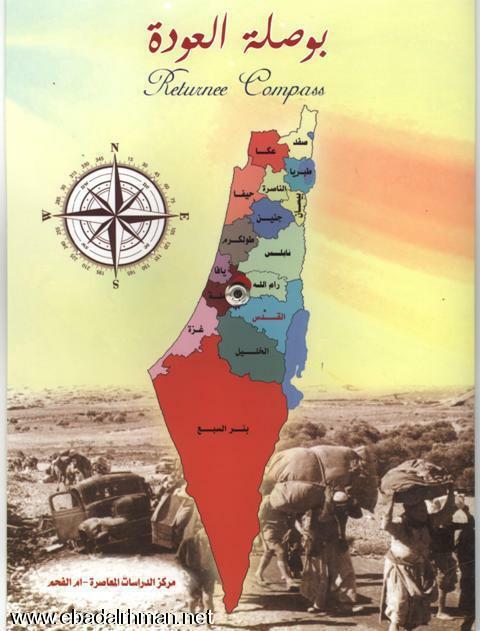 Caption: Our compass points to the Return To Jerusalem and ALL OF PALESTINE.. FROM RIVER TO SEA. Caption: Save Jerusalem… Save Palestine.. From River to Sea..